Have you tried wheat germ oil for skin? Most likely not, right? Wheat germ oil isn’t exactly a popular body oil or anything. It’s no jojoba oil! But you should try it – especially now that it’s winter. The oil is thick and deeply moisturizing; which is what you need to fight off dry, winter skin! Why use wheat germ oil for skin? The oil is made up of essential fatty acids like linoleic (omega-6), palmitic, and oleic (omega-9) acids. Plus it has vitamins A, D, and E and minerals. Actually, it has the most vitamin E among all the vegetable oils. That’s why I started using the oil. Vitamin E is amazing for skin! Being a Caribbean gal, we don’t get winter here. So dry winter skin isn’t a problem for me. But my sister lives in the US and the poor kid (she’s ten years older heh!) complains about the layers and layers she has to wear to battle the cold weather. She gets really dry skin too and, while coconut oil is her favorite, she loves wheat germ oil. She uses it to lock in moisture and prevent dryness, and itchy, flaky skin. I use wheat germ oil more as a moisturizer – especially on my feet. Hey, they have to be flip-flop ready any time! The oil keeps my skin from looking ashy and prevents heel cracks. Sometimes I use the oil on my knees and elbows too. I’m sure you have vitamin E serum somewhere on your vanity. Or in your makeup bag. I do. Vitamin E is the best for skin. It is antioxidant and anti-inflammatory. As an antioxidant, the vitamin reacts with reactive molecules on your skin, formed by UV and sunlight exposure. These reactive molecules can damage your skin, cause sunburn and so much more (like skin cancer). But vitamin E says buh-bye to all of that. It protects your skin from those reactive radicals. As an anti-inflammatory, the vitamin can calm red, irritated, angry skin. There’s even a study from Iran that found you can use wheat germ oil for skin conditions like psoriasis and eczema. I like using the oil after shaving my legs. Without it, I get little red, itchy bumps. But the oil really calms everything down and makes sure there’s no inflammation. I don’t know how. The scientists aren’t so sure either. But they’ve found that massaging wheat germ oil on your skin improves circulation. Maybe it’s because there’s more blood flow to the skin so more oxygen gets in there. Needless to say, the oil leaves your skin looking radiant. Add a little lavender oil too for a great smelling massage blend. I don’t use the oil on my face because it makes me breakout. There are ratings for oils that cause acne (called a comedogenic rating) and wheat germ oil is given the highest, acne-causing rating. So that’s probably why I breakout. On my body, it has no effect though; just my face. Another thing I found is wheat germ oil should be avoided by those who have Celiac disease. Wheat germ has gluten in it. I don’t think the oil has gluten, but it’s better to be safe and avoid it if you have gluten allergies. Or patch test it to make sure you aren’t reacting to the oil. I only use NOW’s wheat germ oil. NOW has been around a long time and I’ve been using their oil for a while now. You can find the 16 ounce bottles on Amazon [affiliate link] and that should last you the entire year. 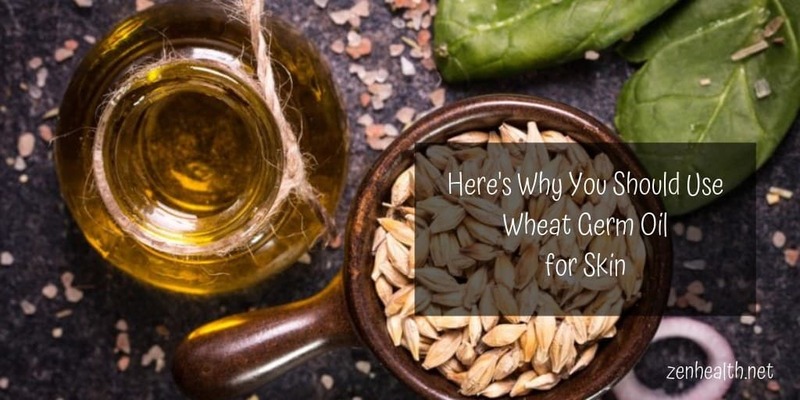 So are you convinced to use wheat germ oil for skin? Have you even heard of the oil before? Would love to hear your stories! I always learn so much from your posts! I’ve never tried wheat germ oil for my skin, but I may have to now. 🙂 Thank you for sharing!